It's no secret that we work with a number of publishers to give away a steady stream of books to aid aspiring developers - after all, if we help developers, the entire Android ecosystem as a whole is enriched. But for some people, simply reading a book isn't the ideal way to learn. It's for these people that informIT has released Android App Development Fundamentals LiveLessons - a series of downloadable videos that are designed to teach Java developers how to build apps for Android. The series includes 9 lessons (each lesson is a video), with costs ranging from $4.99 to $9.99 and, excluding the first two introductory videos, generally run for over an hour. Alternatively, the entire series can be purchased for $119.99. 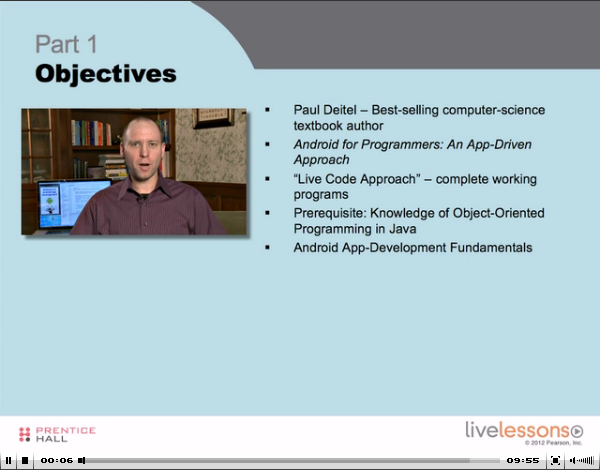 Android Android App Development Fundamentals LiveLessons Part I is for Java developers new to the Android development environment. Each lesson in this LiveLesson shows you how to build one particular app, and each of these apps was carefully designed to introduce you to key Android features and APIs. After watching these video lessons, you will know everything you need to start building Android apps. Your instructor, best-selling author Paul Deitel, begins by showing you how to install the Android software stack and work in the Eclipse IDE with the Android Development Tools (ADT) plug-in. He then walks you through seven fully-functional apps that show you how to build your own world-class Android apps. We are once again working with informIT on this giveaway, and they've been gracious enough to offer 10 download codes. That's right: 10 lucky winners will receive a code to download the entire series! As the videos are download-only, this contest is open to everyone in the world. To enter, simply leave a comment below, and be sure to use a valid email address in the email field of your comment so that we can contact the winners. The contest is open from now until Monday, March 26 at 11:59PM PST. So what are you waiting for? Head down to the comments and get your name in! Angry Birds Space HD Is Finally Available In The Play Store For $2.99, But Honestly, Rovio, Why?